Today is the 7 year anniversary of wedding for Wendy and me. In 2003, I was admiring Kayne for 4 year wedding anniversary, one week after Wendy and I got married. After 7 years, we are even more happier – than 7 years ago. Wendy and I am together since 1996, much longer than getting married – that is about 14 years ago. In 2003, I can still list what we did together in the last year. Now, I found it harder to make that list – it is easier to list what we didn’t do together in the last 7 years than things we went through together. All the sweet, and pains, we came along together. The same experience made us similar persons, and one family. Thanks Wendy for the wonderful years, and look forward to the long, long future to come. The year of 2010 arrives. Happy New Year! I never expected I could welcome the new year the way I did. To be short, I ended up helping to deliver milk tea at the New Year’s Eve. Let me tell you more. Wendy and I brought Yifan to celebrate the New Year. Yifan happily played in the Metro station and enjoyed watching metro trains. Wendy’s milk tea shop was doing very well, but no one ever expected that the huge volume of people after 10:00 AM. Many shopping malls close at mid-night, and many people waited till 0:00 AM to celebrate that wonderful moment with their loved one. Then, the small shop is suddenly short of hands, and there are long lines of people waiting there. Then we sent Yifan back home, and went to the shop to help. I choose the only job I can do – delivery the tea after it is made. Let me share the interesting experience with you, as a milk tea server. My good friend in eBay was definitely right. He quit his job as executive of the big company and started to sell ice-cream for some time. He told me how good it is to see people’s smile to receive the icecream. I experienced similar thing when I deliver the hot tea to people in the freezing cold nights, especially those who have waited for some time. Doing physical work make people happy (at least in between of computer and business related work). It is nice to say thank you to everyone, and see someone say thank you to you. It is amazing how quick people can make a cup of tea – faster than I can deliver. There are many steps involved, and there are many ingredients, but the experience girls just made it so quick – 20 – 30 seconds per cup. Some people are rude. To my greatest surprise, most rude people I saw that night are women, and many of them are very young. They throw their tickets to the table (some times, it directly go to the ground). It makes me think the right of a customer. No customer is entitled to be rude, no matter how much money you pay. I am in a little bit better position to keep confident, and don’t bother about the offense. I don’t feel bad because in this interesting scenario, I know my pride has nothing to do with other people’s attitude. To conclude, what was a nice experience for me. That is very different from my previous world. I talked to at least 50 times more people than I do on my daily life. P.S. Just curious: anybody who bought milk tea and saw me there? I know this may be very surprising news for most of my friend, but it is not a joke. 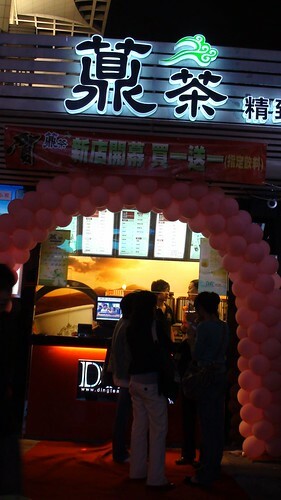 Wendy (if you don’t know her yet, she is my sweet wife) opened a Ding Tea (a Taiwan brand) milk tea shop at People’s Square in Shanghai. The grand opening is today (well, not an extremely grand opening, but a warm, crowded, and nice opening). It is at the corner of Xizang Road, and People’s Blvd. 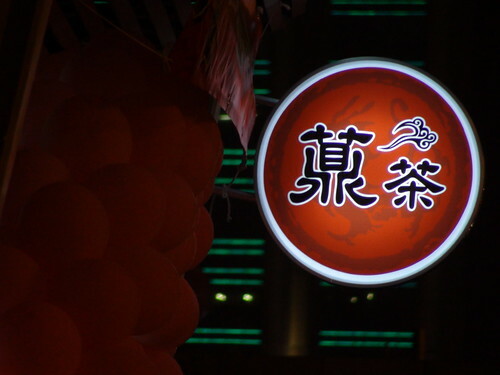 It is also at the gate of the People’s Park and at Metro Exit #3 of People’s Square station of Metro Line #1, #2, and #8. This is an even more important question. Wendy always has a dream of opening a milk shop (it seems it is many girls’ dream), and I support her to do it with all my heart. Too often that people have dreams but don’t have time to go for it, and I am happy for Wendy to be able to do it. It is more about a hobby and an experience, other than anything else. 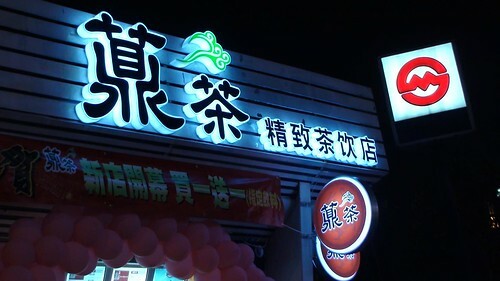 The next you visit the People’s Square, do stop by the store and have a cup of milk tea. If you have a Dianping account, you are welcome to leave your comment there. Will life under camera be better than without one? I guess the answer is yes, just like life with blogging. After play with Sony Handycam CX500E for two nights, I said this to Wendy: “You know when we should have bought this camera? 1996!” That was the year when we just met. Look at this sweet family! P.S. I am trying to recover my account on eBay – that was registered on Nov-13-01 in China – a 8 year account with eBay. It was suspended…. Hmmm…. It is a tradition between Wendy and I that we will take one day off, and spend the whole day together to celebrate our anniversary. I looked through my previous blog articles, to try to remember what we did before. Although I don’t write down exactly what we did each year, I have a rough idea of the past 5 years. March 17, 2003 Marriage Announcement. We got married. March 17, 2004 OOB for Wedding Anniversary We went to Sanya, Hainan to celebrate the first anniversary, after buying our car Goudaner. March 17, 2005 No blog entry, but we went to the Fengxian Beach of Shanghai. March 17, 2006 Report from Search Engine Strategies I was not able to be able to spend the third anniversary with Wendy due to business trip. A pity. March 17, 2007 4 Year Anniversary of Wedding – we went to attend Ziheng’s wedding ceremony. March 17, 2008 Shanghai Zoo. We took one day off, and visited the Shanghai Zoo together. So today, both Wendy and I took one day off, and went out of Shanghai. We once planed to have breakfast at Garden Hotel where we hold the wedding ceremony, but we wake up a little bit late, so we had simple but happy breakfast at KFC (oh. I know it is not as romantic as it should be, but it is also very sweet). Then we drive all the way to Suzhou. We had nice lunch at Wumen Renjia 吴门人家 near Zhuo Zheng Yuan. Interestingly enough, we made a small mistake to have ordered three fat meat dishes. Anyway, we don’t care about adding weight today. Then, we visited my favorite place in Suzhou – Suzhou Museum by I.M. Pei. I became the tour guide to show Wendy the wonderful architect of the museum. In the afternoon, we visited Wendy’s favorite area Jinji Lake of Suzhou. I will surely use another article to tell you the miracle of Jinji Lake. 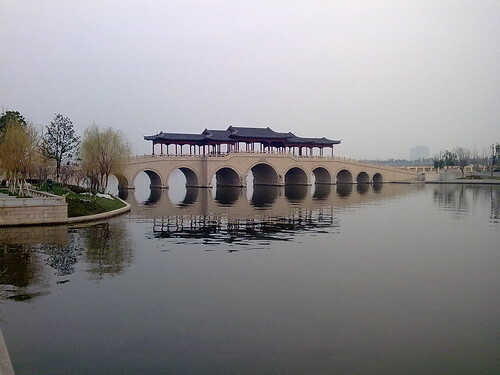 It is a another modern West Lake in Suzhou. We had Haagen-Daze ice cream, and Japanese food on the Ligongdi of Jinji lake. At about 8:30 PM, we returned via A11 (1 and half hour drive). We are happy to see Yifan smiling at home. I’d like to take the time to thank Wendy for all she has done for me and the family in the last 6 years (actually it is 10 years since we lived together). Wendy is always gentle, nice, smart, caring, and patient… I always think I am the luckiest man to have Wendy, and we fits each other very well. ( According to MBTI test, I am an ENFP, and Wendy is an ESTJ.) Wendy, Happy Anniversary. Wendy’s team in Microsoft support India customers. Something she suffers a lot is the India accent English. She now brings an iPod, and put some India podcast in it, and listen to India English all the way to work and back to schoo. However, Chinese can only understand 10% of Indian English. (The numbers are just for illustration propose – my guess number – you just get the idea). The key is Mumbai – it was pronounced something like Bum-‘bay with strong sound on the ‘bay’ part. I hope Wendy can get used to India English soon, so the conference call is not that painful, but I also hope Wendy do not speak India nEnglish after that. Wendy called me this morning, and told me her wallet was stolen at Xujiahui. It is just 100 meter from where I dropped her off, and her office, and the pocket picker steal her wallet easily and quietly. Typhoon hit Shanghai, and everywhere is wet and everyone is watching their steps, and this is the best time for those bad guys. Wendy lost all his bank cards (credit cards and debit cards), Sodex card (for use in restaurants), public transportation card, and card to enter our residential area. She also has her National ID in it, plus small amount of cash. She spent quite some time to call all the related bank to claim the lost of the cards, and it may take much longer to get a new National ID. Not many people can make us more angry than a pocket pickers. I hate them. However, my second thoughts are, there are many more people other than pocket picker who took more money from our pocket and did it more frequently, but we never really noticed. There are thousands of ways to do it – legally or non-legally. I recently read many books on financial and politics. That is the reason this pocket picking even made more alerted of those invisible “robberies”. Wendy, thank you so much for finding my passport, finally! I was not able to find my passport anywhere at home – not in my document case, not in the drawers I used to put passport into, not everywhere. I don’t want to lose it again. Finally, Wendy found it in the side pocket of my camera case! the passport must be with me during my last overseas trip – it was in this March in Cambodia . What was with me during the trip? If the travelling case turned out to have nothing in it, what else did I brought into that country? The she directly went to the camera case, and searched it inside out. She finally pulled the passport out of the side pocket. I also searched that camera case, for twice, without finding anything. Thank you Wendy! 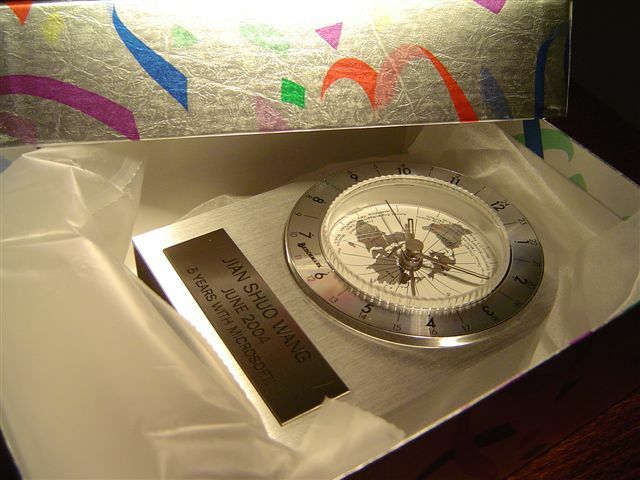 Let me write an entry as a small gift to thank you. 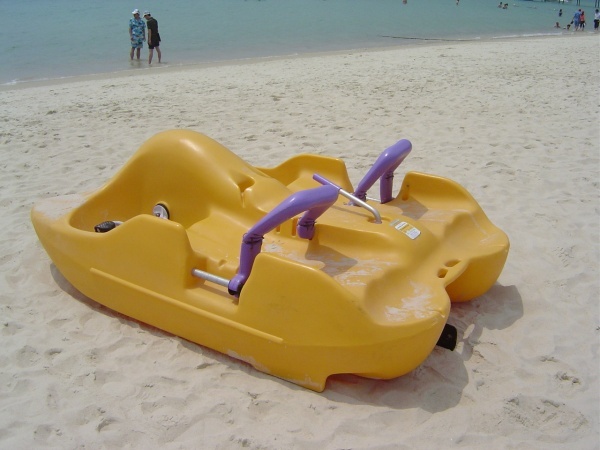 Photo of the lovely banana boat at Sanya, Hainan. Taken in 2004, on the day of our first anniversary. P.S. From the passport, I found out my last visa expires on Oct 18, 2007 – my birthday. That is also my only valid visa on my passport. Well. That is to say, I cannot set foot in any country outside China and U.S. The annoying fact is, even in China, I cannot enter Hong Kong without a new visa-type of permit. Wendy is happy today, since I bought her a Apple iPod Mini. I further realize money won’t make people happy, but gift will. Gift will make two persons happy. I cannot believe how popular iPod is in China. We went to the iPod Reseller at the Metro City, and it was crowded there. About 6 customers are pushing each other at the desk to get a chance to experience iPod. The price for the iPod Mini is 1650 RMB (around 199 USD). 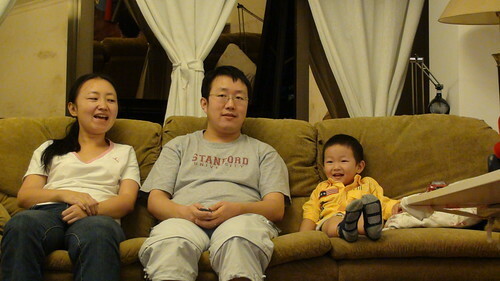 On Sept 21, 2003, Wendy and I held our Big Fat Wedding in Shanghai. Today is the one year anniversary. Although Wendy and I take March 17 as our wedding memorial day, I am still very excited to recall the sweet time of the same day last year. Wendy completed her first driving course this morning. Now she is able to put the gear to the first and second shift. During my long business trip to Beijing, Wendy has to go to work by Metro, while the car was parked there for two weeks. Metro is, any way, the reliable, convinient and cheap transportation. There is news that Shanghai will pause the Metro plans in response to the country wide adjustment of enocnomy. One week later, the speakman of Shanghai government proactively communicated with the citizen that the news was not true and Shanghai will continue to build more Metros in the future and move 40% of the transportation volume to Metro. The other 30% is buses.